We Love What We Do and It Shows – Let Us Show You! See Bar Harbor and Acadia National Park the Best Way, “From Above”. With Scenic Flights of Acadia, you will gain a unique perspective of Bar Harbor, coastal Lighthouses, Acadia National Park, Cadillac Mountain and more. Walk-ups are welcome, or call ahead to reserve a time for you. Reservations are required for our unforgettable Sunset Flights. You will be very comfortable in our high-wing Cessna 172, offering unobstructed views of the beauty below you, with an experienced Commercial Pilot at the controls. Our pilots are very knowledgeable of the area and will share information on the sights, as each seat is equipped with an interactive headset making for easy conversation. Cruise Ship passengers or other visitors needing transportation – Take the free Island Explorer Shuttle Bus – Route #1. Show the driver a brochure and they will drop you off at our location and then pick you up after your flight for your return to Bar Harbor. We are committed to being a good neighbor by minimizing aircraft noise. 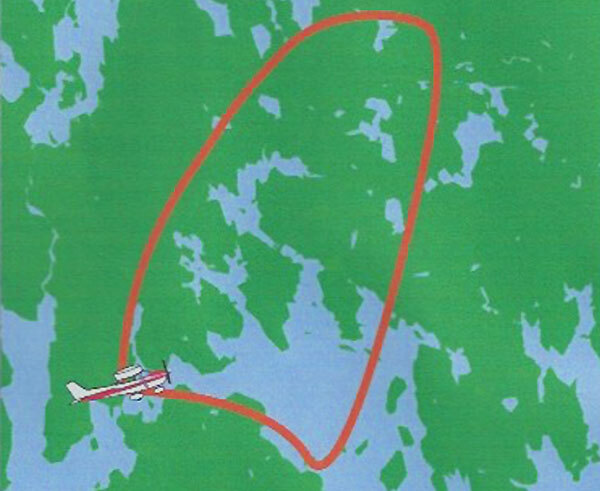 We operate the quietest airplanes providing tours near Acadia National Park and the Bar Harbor area. Our flights are tailored to provide the quietest flights and exceptional views of the area. 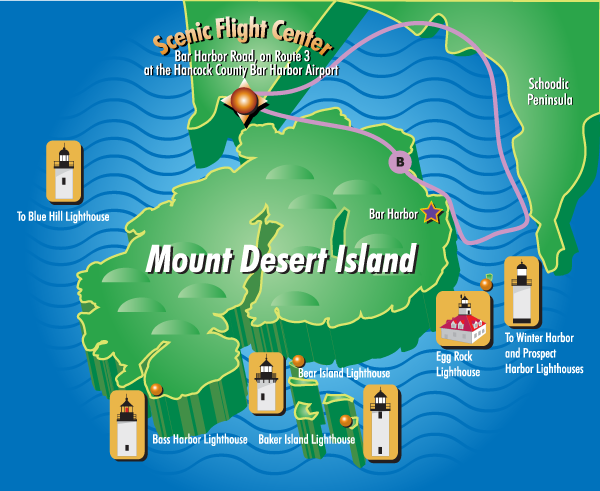 This picturesque flight brings you towards Downeast Maine, flying by Hulls Cove, Bar Harbor, Sand Beach, Egg Rock Lighthouse then on to Winter Harbor and its lighthouse with spectacular views of Schoodic Point, Frenchman Bay and inlets. You will enjoy fantastic views of the whole Mount Desert Island on this popular flight as it flies around the entire perimeter shoreline, highlighting Bar Harbor, Cadillac Mountain, Northeast Harbor, Southwest Harbor, Bass Harbor then on to the beautiful cliffs, mountains and islands along the western shore. This tour showcases three historic lighthouses. See it all with this favorite flight! In addition to the beauty of the All Acadia tour of Mount Desert Island, your flight will head off shore to capture the stunning views of Schoodic Point to the east, Baker Island and the Cranberry Islands to the south and the Blue Hill area to the west. Seven coastal Lighthouses are highlighted on your journey. This ultimate excursion will offer you stunning views of areas that few visitors witness. Enjoy the natural beauty of the Maine coast while savoring some of Maine’s best Lighthouses, shorelines and islands. Twelve Lighthouses along with Fort Knox and the Penobscot Narrows Bridge are highlighted on your personalized tour. This is a must-see for Lighthouse enthusiasts and those wishing to view the Maine Coast and Islands as only seen from the unique perspective of above. Two passengers minimum for this flight. Special – Fall Foliage Flight! Starting from the airport, you’ll fly along the coast to Bar Harbor and Cadillac Mountain before crossing Frenchman’s Bay to head inland to Tunk Mountain; from there you’ll wind through the surrounding mountains, lakes and fields on the way back to the airport, all in the search of the best and brightest fall colors. This all-inclusive exclusive tour provides transportation to and from your Cruise Ship or Hotel to the Bar Harbor Airport and return. You will fly in a high-wing Cessna 172 aircraft providing fantastic views of Acadia National Park as well as several coastal Lighthouses, views only seen from above. Your private air tour will be personally narrated by our experienced Commercial Pilots. (2-person minimum). We will provide transportation from the pier area in Bar Harbor to the Bar Harbor Airport in Trenton and return. Approximate driving time is 20-30 minutes. Our Scenic Flights will depart from the Hancock County/ Bar Harbor Airport. We will then fly over Mount Desert Island, Acadia National Park, seven area Lighthouses, as well as the Cruise Ship that you arrived on. Departure Times: Start at 9:00 a.m. until 6:00 p.m. The 6:00 p.m. time is for our sunset flight and is subject to change as sunset times change. For those who want to see an area not in our standard tours, we can provide a customized Scenic Flight or Aerial Photography Flight. Whether it is your own personal property, a list of ‘must-see’ Lighthouses or anything in between, just let us know what you want to view from the air and we will give you an estimate of the time and cost. Just call us for more information at (207) 667-6527.